Joyful, redeemed, set free: the theme and the message of the Christ Festival was spread up to heaven and throughout the earth. Around 13,000 visitors took part in the ecumenical “Christusfest” (Christ festival) at the Ehrenbreitstein fortress in Koblenz, on the Monday after Pentecost. The closing service took as its theme “Jesus Christ goes ahead of us” and was devised by leading theologians from the Protestant, Catholic, Old Catholic and Orthodox Churches, along with the Free Churches. 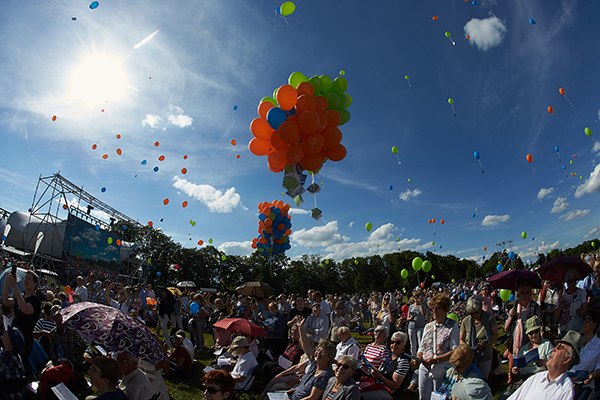 At the beginning of the service 1,000 balloons were released into the air, as a sign of blessing from the Christ festival. The President of the Rhineland Church, Manfred Rekowski, called the service a symbol of the fact that in the course of the previous year the Christian churches have “abandoned their confessional fortresses”. “We are standing here as representatives of different churches”. Each church has its own particular history and significance. Rekowski went on to say “We have learnt to set out on the journey together and to clear out of the way the rocks and stones that have hindered us from being able to bear witness together to our faith in Christ”. The Bishop of Trier, Stephan Ackermann, remembered the Holy Robe pilgrimage in Trier in 2012, in which all the members of the South West region of the Council of Christian Churches (ACK) participated. What had previously been an object of ecumenical irritation, the Holy Robe, had become a symbol of the persistent search for unity. Bishop Ackermann said that it had succeeded in making us look at what we had in common and to acknowledge the gifts, the pious practices and the variety of lifestyles of the different denominations. “It is Jesus, the one who is alive, who goes ahead of us. We are called to follow him”, said Pastor Jochen Wagner, chair of the South West region of the Council of Christian Churches (ACK), in his sermon. Just as Christ went into Galilee ahead of the women who stood at his empty tomb, so it is that he goes ahead of all believers. Following him means moving forward. In his message the Pastor of the Free Evangelical Church of Kirchenberg in Hunsrück stressed that: “For in this way we are also called out. We are being called out from our narrow denominational constrictions – so that those things that belong together can finally grow closer together. One lord, one faith – and we are already well on the way with regard to Baptism”. All through the day the Ehrenbreitstein fortress was dominated by a colourful Kirchentag-style atmosphere. In the morning, visitors arriving at the entrance to the festival site were greeted with the festive sounds of the brass band players of the Association of Protestant Churches in Koblenz. More than 1,500 people joined in celebrating the ecumenical opening service, with the theme “joyful, redeemed, set free”. It was also broadcast live on the Deutschlandfunk national radio station. There were four open-air stages with music from bands and choirs from all over the region, as well as drama presentations and cabaret, all related to the Reformer Martin Luther. In the Market of Opportunities there were presentations about their work by 23 groups and initiatives from all over the Rhineland-Pfalz, from the police counselling service to the environmental network of the churches in Rhine-Mosel. A large number of visitors also took the opportunity to fasten up their own theses about ecumenism onto the “thesis-door” of the Ecumenical Council of Churches in Linz and Bad Hönningen/Rheinbrol/Hammerstein. For children and young people there were hands-on creative activities relating to the theme of Reformation and faith.